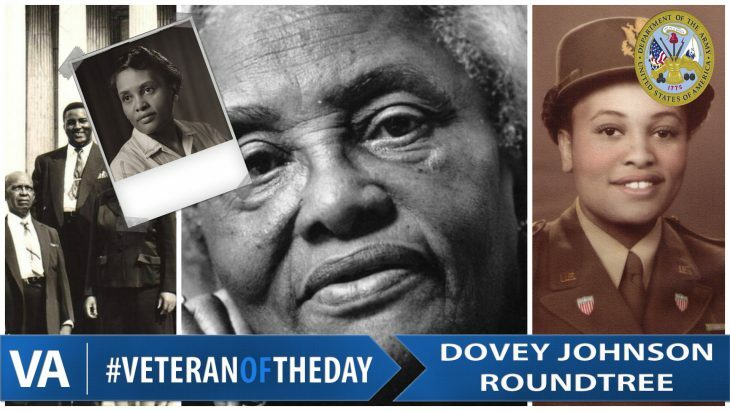 Today’s #VeteranOfTheDay is Army Veteran Dovey Johnson Roundtree. Dovey served from 1942-1945. Dovey was born April 1914 in North Carolina, graduated from Spelman College in 1938 and briefly taught in school in South Carolina before enlisting in the Army. She was recruited by Dr. Mary Bethune, along with 39 other African American women, to initiate the Women’s Army Auxiliary Corps (WAAC). Dovey achieved the rank of Captain and was responsible for the recruitment of African American female soldiers during World War II. After her service, Dovey was motivated to continue making a difference in the world after the war and decided to enter Harvard Law School. After graduation, she began practicing law and became known for her criminal defense cases, civil rights and advocacy for children and families. She earned many awards and honors for her work after the service and was honored at the Women in Military Service for American Memorial in 2009. She passed away on May 21, 2018 at the age of 104. Graphic by Joe Misko. Joe is a Graphic Design major with a minor in Business at Central Connecticut State University. Yet another woman who silently paved the way for me and my sister veterans. In memoriam of the dedicated service of Army Veteran Captain Dovey Johnson Roundtree and to all throughout the years, thank you. We honor the dedicated service of Army Veteran Captain Dovey Johnson Roundtree and to all throughout the years. We honor the service of Army Veteran Dovey Johnson Roundtree. Very often, I read these ‘Veteran of the Day” articles. I always want thank the Veteran for their courage and service if at all possible. I also note the author. Please give the readers a chance express ‘kodos’ and let each veteran or their family know that they are not forgotten.